Drivers across the Cental Valley have a wide variety of options when it comes to routine auto repairs. If you simply shop price or hastily go to the garage that can fit you in on short notice, we suggest you consider Nissan of Stockton for your next auto repair. Why? Because the parts and service professionals at our 3077 East Hammer Lane headquarters try to form a unique relationship with each one of our clients, so when it comes time for routine maintenance or emergency repairs, they'll know they have a friend in the business. 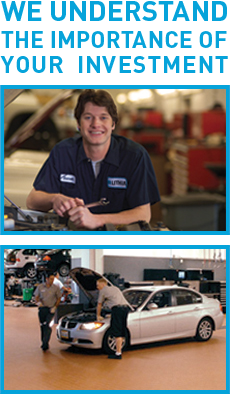 From oil changes, tire rotations and brake repair to even the more complex service solutions involving muffler and exhaust systems, and steering and suspension tune-ups, the Nissan of Stockton crew has the same goal in mind: offering our clients fast, friendly and professional service at the most reasonable price. Learn about one to one rewards to see how you can earn free cash back and rewards points at our dealership. Our online service request tool allows you to schedule both routine maintenance and emergency repairs online, twenty-four hours a day. That means, unlike some area garages, we work on your schedule instead of the other way around. Need a big repair job done but are worried about the cost? Let Lithia Nissan of Stockton put your car back on the road and your mind at ease with our service financing option." We also welcome you to stop by our East Hammer Lane headquarters or give us a call at (855) 315-4414. Because at Nissan of Stockton, you've got a friend in the business! Nissan of Stockton services new Nissan and used Nissan, and all other makes and models. It's easy to schedule an appointment online at Nissan of Stockton. We're convenient to Modesto and Elk Grove California. Just drop your car off and we'll usually deliver same day service for most auto repairs, truck service and car maintenance. Whether it's an oil change, brake repair, tire rotation or you just want a seasonal inspection, Stockton Nissan is right here for you. We can handle any car repair, from a transmission to exhaust, right here at Stockton Nissan and emergency roadside service in Modesto, Lodi and Tracy California . Take advantage of Lithia's Assured Service Contract or Lifetime Oil Program . Here's Lithia's New Tire Protection Pledge! Watch service videos online! Life is busy. For those who find cramming in another fix or auto repair to be just another chore, there is the Nissan of Stockton service center. Make an appointment for your Nissan maintenance or larger repair at our state-of-the-art service center, conveniently located at 3077 East Hammer Lane in Stockton, California. For a complete list of services and repairs available to drivers from Elk Grove, Central Valley and Manteca, reach out to us today. If you need it done? Chances are we do it. More than that - we do it with certified Nissan parts.